Fairy wasps are some of the tiniest creatures on Earth, an entire insect roughly the size of a single-celled organism like an amoeba. That means their individual cells must be incredibly tiny...and that requires losing much of their nervous system. 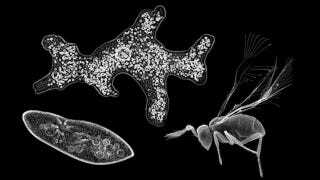 The fairy wasp, otherwise known as the fairyfly, is a parasitic insect that can measure as little as 200 micrometers long, making it roughly the size of unicellular organisms like amoebas or paramecia. Of course, this insect isn't a one-celled organism, which means its thousands of individual cells have to be shrunk down to unbelievably small sizes. The fairy wasp's tininess has its uses - it's able to avoid most predators and invade other insects' eggs undetected. But there's a pretty hefty trade-off for the creatures' biology, according to new research from Alexey A. Polilov of Russia's Lomonosov Moscow State University. He discovered that as much as 95% of neurons in adult fairy wasps don't have a nucleus. That's surprising, considering a nucleus is generally considered a pretty crucial part of a cell, particularly since it contains the cell's genetic material. And while baby fairy wasps do feature a full set of nuclei in their neurons, they lose them as they grow older. This sacrifice is apparently what allows fairy wasps to remain so ridiculously tiny, and losing so many seemingly crucial nuclei doesn't actually matter all that much, considering fairy wasps are still able to do all their complicated behaviors, like flying around and invading other eggs. It almost makes you wonder why us bigger species still bother with all these cellular extravagances... you know, like fully functioning neurons. Via Arthropod Structure and Development. Image by Alexey Polilov via ScienceNOW.